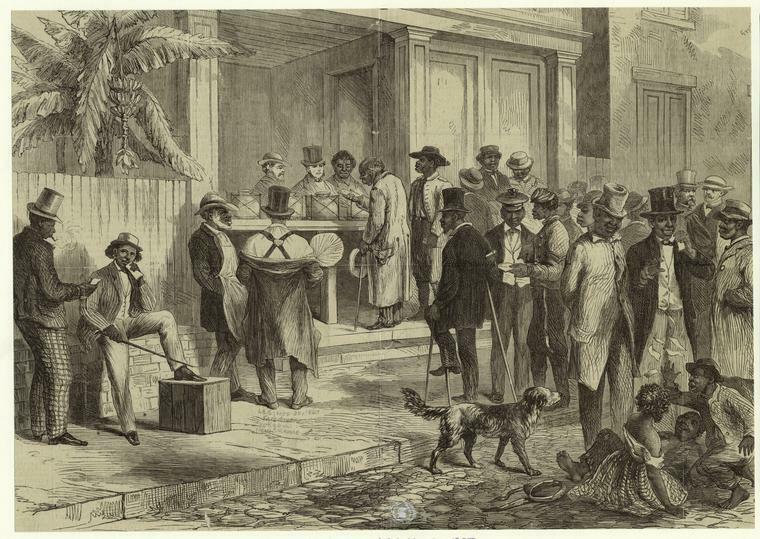 One of the many important rights that African Americans pursued after emancipation was voting, seen in this image during the 1867 election in New Orleans. The streets are filled with African American men of varying statuses as they utilize their new found freedoms at the ballot box. African American men maintained that their manhood and military service during the Civil War justified their rights as citizens, including and especially the right to vote. Even with the passage of the 14th and 15th amendments that secured African Americans’ status as citizens and black men’s right to vote, the post-Reconstruction era challenged and briefly negated the gains that has been made for black rights after the war.